SANTA FE, N.M. — The vibrant colors and hues in Georgia O'Keeffe's paintings soon will be on full display for color-blind visitors. The Santa Fe museum announced Monday it's teaming up with California-based EnChroma to expand the gallery experience through special glasses. 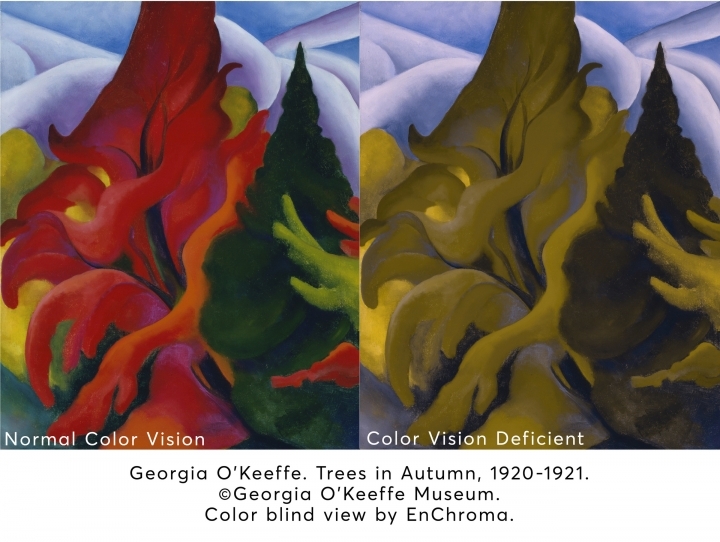 Starting May 3, visitors with red-green color blindness can borrow glasses to see O'Keeffe's work in the way that she intended. One of the museum's curators, Katrina Stacy, says O'Keeffe in her later years developed visual impairment from macular degeneration and turned her attention to sculpture. Stacy says the project with EnChroma has ties to that part of the artist's story. EnChroma co-founder Andrew Schmeder says O'Keeffe juxtaposed colors from nature in ways that evoked emotion and seeing that relationship between colors has been challenging for people with color blindness.